Looking for a solution to your style dilemmas? Why are some women so confident in their style? Even if they “shouldn’t”, why do they look SO good? What’s their secret? What do they know that you don’t? Ready to make your style dreams a reality? Have you ever wondered why some women seem to inhabit their style so completely, so naturally, so uniquely, when maybe you seem to struggle and chafe against an idea of style that isn’t quite yours or to try to subscribe to an ideal of style that doesn’t quite fit you? It’s easy to become overwhelmed, confused, disenchanted, blasé, skeptical, cynical or simply bored with the sheer number and variety of (not to mention inconsistencies in) those style messages. Style can seem so hard to get right. Don’t you wish you could find style answers that are tailored to who you are as a human being … not just a human body? Not sure of your psychological type? Right now, so much of the style information available to you confuses and overwhelms. It’s trivial and superficial, it’s inconsistent and lacking in relevance to you. A woman with many facets to who she is, what she thinks and feels, and what she does. Style information that doesn’t belittle or reduce, generalize or confuse. You want a style solution that caters to YOU – not cookie cutter advice designed for Every Woman. Don’t you wish you could find an intelligent, thorough and meaningful system for cutting through the style hype and getting to the essence of what style is for you? We have cut through the fashion hype and uncovered the style essence that makes style meaningful. We have created a style approach that treats you not only as a human being but a unique and wonderful woman. What is 16 Style Types? How you dress and present yourself, your style pillars and values, your style strengths and style challenges, how you shop and where your style ideas and inspiration come from, your approach to establishing and maintaining your wardrobe, your approach to getting ready for the day, what priority you place on style and its significance to you, how you develop your style throughout your life, and ultimately how you express your style to the world. Who you are, your psychological type. Your natural tendencies, your innate personality preferences. Why you are the way you are, how you see the world, how you make decisions, what energizes you, where you get your most trusted information from, what drives you crazy and what makes your heart and mind sing. When you understand your personality preferences, your ‘type’, you can better appreciate, rely on and use your natural gifts. There’s 16 because there are 16 psychological types according to the Jung/Myers Briggs model of personality (you may know of this through tools such as the MBTI®). 16 Style Types is like nothing you’ve seen or come across before. We’re not boasting, we’ve just done the research and know that no other system like this has been created before. We’re excited by that, and we can’t wait to share 16 Style Types with you. How did you find the connection between style and the 16 types? We’ve spent three years researching the connection between style and personality and invested countless thousands of hours in developing our content. We’ve interviewed women from each of the 16 personalities and tested our materials with women from around the world of each type. We’ve done the work, and we know what we’ve created is of the highest quality. It truly is world-class. We stand behind 16 Style Types as a peerless program. Worldwide authority on psychological type, Dr Jane Kise is the author or co-author of over 20 books on psychological type, leadership, education, and communication. An award-winning leader in the psychological type field, Jane shares her depth of knowledge through widely, from a TED talk to corporate workshops and international conferences. World-class expert on style, Imogen Lamport is a leader in the world of image consulting and reaches millions of women every year through her refreshingly intelligent and insightful style blog. Regularly called to speak at professional international conference and in the media on image related topics. Global facilitator Jill Chivers is both an image consultant and psychological type expert, bridging the worlds of type and style. A regular on the media circuit Jill shares her expertise online as well as being hired by global firms to facilitate impactful learning programs. Awesome report!! It is so thorough and so interesting, and I found it very practical and useful. You nailed the styles and certainly nailed the characteristics in my personality. It really highlights and underscores that personality is a huge influence on style and clothing choices. Goosebumps!!! Tears of having my INFJ challenges clarified and clear solutions offered. Wow. It was more accurate for me and in more ways than I’d have expected. It clarified so much about why it often felt like I was hitting my head against a wall. It’s not that I lacked style, I simply had one all my own that didn’t show up in magazines, in corporate boardrooms, or in any other system of style I’ve come across. What will your Style Type Report Give You? You’ll finally understand why you approach style the way you do. What a gift to give yourself. We understand you – and you too will be able to recognize and embrace the uniqueness that is YOU. You’ll receive clear, specific-to-your-personality guidance on how to express your style. This counsel is based on our deep understanding of your style essence, minus the fluff or hype. You’ll be inspired to become your most stylish self, guided through you’re your style journey to understand where you are now, and how you can confidently improve and enhance your style and image. What’s inside my Style Type report? An overview of your style type, encapsulating the essence of your style. Each style type has four pillars, the foundations on which their style rests. You’ll learn which style decisions support your style type the best. You’ll discover the six things your style type is most likely to do, think, and feel when it comes to their style. You’ll learn the most important things to factor into your style approach to give you confidence from the inside out. Each Style Type has strengths, and, in this section, you’ll learn the top strengths you can capitalize on. And each Style Type has challenges, which you’ll learn about, so you can discover your blind spots, embrace and transform them in whatever way you choose. You’ll meet the seven dressing styles and what each of these contains – and be introduced to how your Style Type interprets and uses each of those seven dressing styles in an authentic way. Each style report contains a stunning visual representation of their style, showcasing one way your style can be expressed in real life, using real clothing and accessories. Getting the most out of your closet – how you organize it, how you maintain it, how you use it – can be challenging. Here you’ll learn how your style type can do it beautifully. You’ll discover the various sources of style ideas, input, and inspiration that your style type most relies on. Stop looking for style in all the wrong places! Each style type approaches shopping in a different way. Here you’ll be introduced to the ways you can make shopping a success for you – every time. Love, loathe, follow or flaunt – each style type approaches style rules in a unique way. And in this section, we’ll overview how your style type can authentically approach style guidelines. Explore and discover your unique style journey through the 4 phases of your style blueprint. No matter where you are now, there is always another step you can take on your unique style path. You’ll be provided with tips and techniques for taking your style type journey further, whether that’s working with a professional image adviser/stylist or with a professional type practitioner/coach. 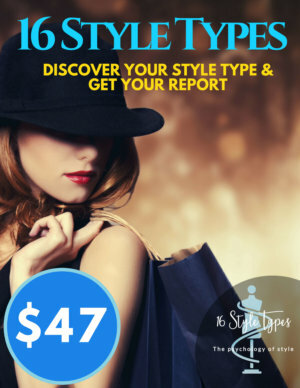 Your style type report concludes with insightful questions to guide you to a deeper understanding and connection to your style essence. How do I discover my style type and download my report? How does the Best Fit Type Process work? 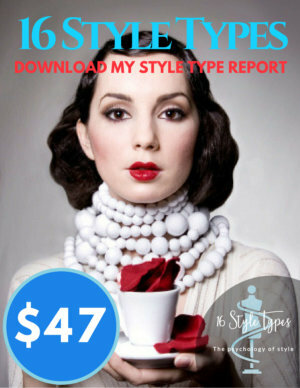 You’ll love your Style Type Report and will use it as your lifelong guide to navigate, embrace and fall in love with your style. My report connects style and personality in a way I’d never considered. It validates and justifies the way I’ve approached style my whole life. I wish I had this 25 years ago. For a long time, my personality was at war with what other women always seemed to wear to work. For the longest time, I thought I lacked style because ‘stylish’ women dress differently to me – when all along I’ve had plenty of style, just not the kind people – and the fashion industry – tried to tell me I ‘should’ have. At least 90% of the Style Report resonated with me. Very interesting. Well researched and presented.